Last week, my family was in town for three days. Not that long of a time, right? And I love my family. But in a town like Coloma, (on the South Fork of the American River), you can’t really expect visitors to be self-entertained. So, I had to come up with activities for us to do for all three days. 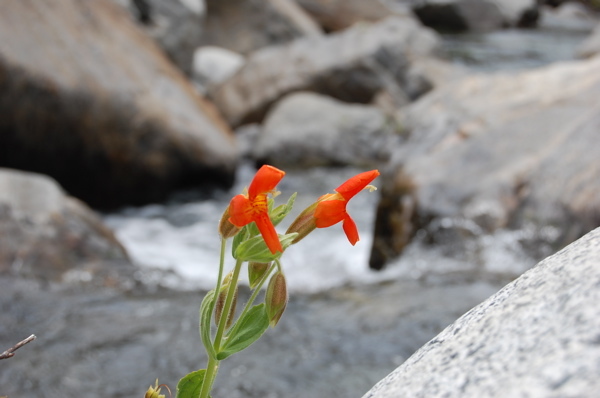 I had one day down, of course: a rafting trip on the Lower South Fork. That part was easy. But what to do for the other days? I decided to take Scott A’s advice and drive about an hour north-east to the next watershed north of the American: the Rubicon. We parked on Elicott Bridge on Eleven Pines Road, and hiked up the north side of the river. It was an awesome place to spend the day exploring. The trail takes you up on a ridge overlooking the river canyon for the first two miles, than drops back down into the canyon to some great swimming holes right where the South Fork of the Rubicon comes in. Time permitting, you can even cross the Rubicon at that point and hike up the South Fork a ways, through lush vegetation and past some small waterfalls. The canyon is at a higher elevation than the South Fork of the American River, and so is much greener and deeply-incised; much more like the Middle Fork of the American. But unlike the Middle Fork, the Rubicon has cut a narrower channel into the rocks, creating dramatic sheer walls and some really interesting rock formations. Hiking along, you get the feeling that you are constantly discovering a new “secret” spot. The water is also a beautiful greenish turquoise, somehow a brighter color than the other Sierra Nevada rivers. 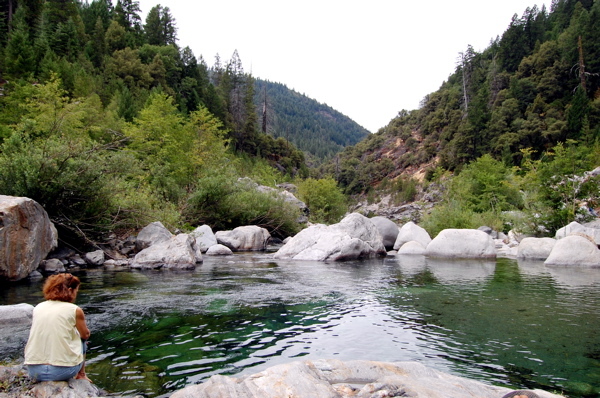 So if a rafting trip on the North, Middle or South Forks of the American River is just one of many days you’ll be spending in the Northern Sierra Nevadas, consider a day of hiking and swimming on the Rubicon. It’s beautiful, an easy hike, and not very crowded. To get there, take highway 193 off of highway 49, going east towards Georgetown. Once in Georgetown, turn left onto Wentworth Springs Rd (also Main St) and drive for about 22 miles before turning left again on Eleven Pines Rd, which takes you down to the river. There is a sign before Eleven Pines Rd that has an arrow pointing left to direct cars towards Hell Hole Reservoir.